A man pleads for his life against a night sky--why? He tells his story, about how he fell into a life of crime. When he saw that a millionaire had amnesia and was resting in Saneville Sanitarium, he was shocked to notice that the man was a "Dead-Ringer" for himself! He murdered the man, buried his body in the woods, and took his place at the loony bin, eventually recovering his memory and getting discharged. But life on the outside wasn't as rosy as he expected it to be, since his marriage was a sham and his business partners hated him. When he is kidnapped by three brothers whose father killed himself after being swindled by the millionaire, he pleads for his life and explains who he really is. They shoot him anyway. 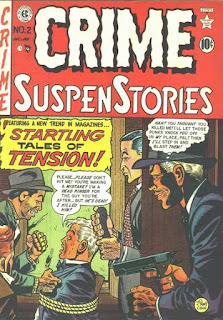 I like this issue of Crime SuspenStories mainly for the cover and the two stories by Johnny Craig. The opener, in particular, features an eye-catching splash page, with four small figures against a big night sky, and a story that moves along rapidly. Craig's second story, "The Corpse in the Crematorium," is not quite as good, seeming like a mashup of "Breakdown" and a Cornell Woolrich thriller, as a woman races against the clock to save her cataleptic husband from the title fate. Peter: "A Moment of Madness" is an effective little crime thriller with an abrupt but powerful conclusion. Ralph Bently is a member of an EC minority: the innocent protagonist who meets a nasty end. Bently is guilty of nothing but job-related stress and being a bit . . . rude at times (after killing a boy's dog, Bently pays the boy's father for his silence and trots off with a curt, "I'd better be on my way!") and yet, in the end, he takes his own life rather than risk killing the woman he loves. Not your typical EC baddie, eh? The other three stories are immensely forgettable with the only aspect of "The Corpse in the Crematorium" worth noting is that Johnny rips off Louis Pollock's short story, "Breakdown" (later filmed for the first season of Alfred Hitchcock Presents), for his nail-biting finale. 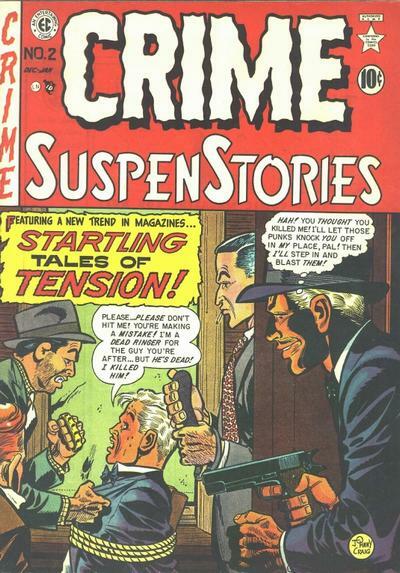 Jose: On the whole I found all of the stories in the second issue of Crime SuspenStories greatly readable. “The Corpse in the Crematorium” is probably the laziest of the lot, no doubt due to Craig pulling double shifts for this issue and thus leading him to “freely adapt” a story that’s been done better elsewhere. “Dead-Ringer” fares well by comparison, the publisher’s classic house style shining through in the story’s depiction of a cheap hood shooting for the high life only to sink deeper and deeper into a mire of bad news and poor timing. Although it’s hard to believe that a group of killers would patiently listen to this guy’s story of how he “slowly . . .” and “carefully . . .” impersonated the life of their intended victim, Craig’s minimalism and noirish angles really up the ante and make this a solid opener. That bleakness and irony are maintained at full boil in “A Moment of Madness” and “A Contract for Death.” Ingels’s story manages to be grim without revealing (or reveling in) much violence, and its doomed tone and vicious climax makes it feel like it’d be a touch more at home in Crime’s yet-to-be-released sister title, Shock SuspenStories. The Kamen yarn is one of the artist’s most enjoyable pieces, one that zips along nicely and packs in one or two nicely dark surprises. "The Corpse in the Crematorium"
John: In "Dead-Ringer" we once again learn that killing someone to get yourself a good life never works out as planned. Craig's splash page is particularly effective. Perhaps because of Ingels's art, I just couldn't get into “A Moment of Madness.” I had high hopes for "The Corpse in the Crematorium," only to be let down by yet another 'nick-of-time' rescue of a character from a ghastly fate, which frankly would have made it a very chilling tale. 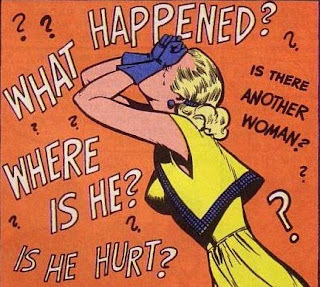 If I wanted to read stories where everything working out for the characters, surely I'd be buying something other than EC Comics. While I enjoyed "Contract for Death," it felt as if a page was missing where they explained why the drunks would kill the doctor because a corpse was left on his doorstep. When mobster James Cooper is sentenced to die, he vows he'll return from the grave to get revenge on those who found him guilty. Coincidentally, a local mad scientist has been working on a theory of how to raise the dead. He seeks out Cooper's fellow gang members and asks if he might experiment on the mob boss after he's fried in the electric chair. 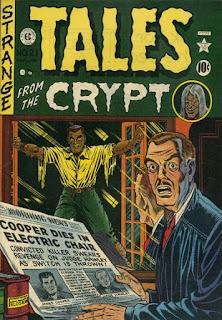 Cooper agrees to the plan and, after he's executed, his body is whisked away to a laboratory where the professor, sure enough, brings Jimmy boy back. Cooper shows his gratitude by plugging the prof and then goes on a mad killing spree, evening up the score with the folks who did him wrong. Unfortunately, for Jim, the prof's plan wasn't foolproof and his body begins to rot. His final would-be victim, the judge who sentenced him to death, smashes the living corpse with a poker and Cooper dissolves into rotted flesh and bone. 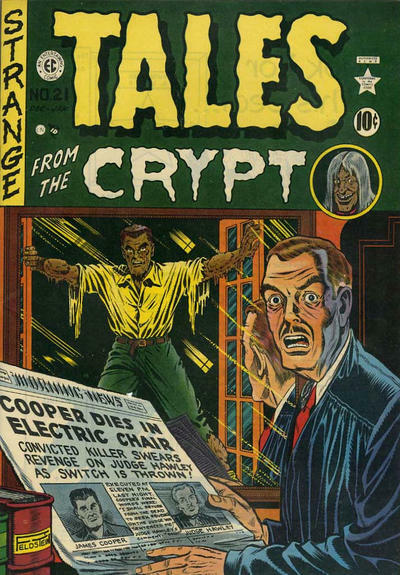 As with most of these early stories, "A Shocking Way to Die" sputters rather than shocks, though Cooper's rapidly rotting features hold the attention nicely. It's laughable how easily the professor and his mobster cohorts steal Cooper's body. 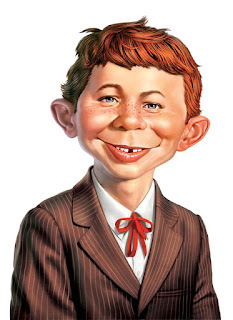 The only jolt delivered throughout the narrative would be the mad scientist's murder by Cooper. Nothing else elicits more than a yawn. Fresh off a wedding ceremony, George and Ruth stop at a creepy little amusement park, ignore all the CLOSED signs, and enter anyway. They happen upon the one attraction still open for the evening, the Water Wheel Ride and, once again, ignore the warnings (including a very creepy ticket taker). The boat ride turns out to be a "Terror Ride" when the couple discover that the ticket taker has been populating his scary attraction with corpses and plans to add two new figures to his ride. The only thing that saves George and Ruth is a slippery boardwalk. Another groaner, but at least "Terror Ride" is saved by Wally Wood's lovely art. It's not clear why the attraction is open that evening or why the crazed owner is killing his customers or, especially, why Ruth and George aren't holed up in a motel somewhere. Serves them right. 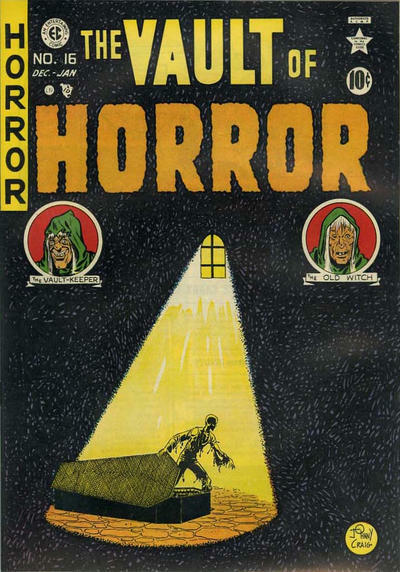 Jose: While we saw a revenant corpse in last month’s “Man from the Grave” (HoF #4), I believe “A Shocking Way to Die” marks a milestone for E. C. in that it is the first story to have a corpse come back to life with the sole drive of vengeance on its leaky little brain. 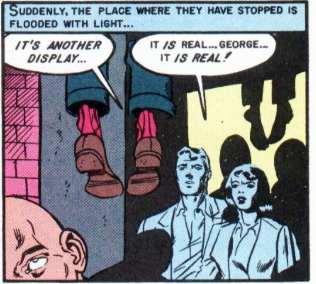 Technically we have bumped into this once before with “The Dead Will Return” (VoH #13), but “A Shocking . . .” is the first time we see the walking cadaver in the act of hunting down its enemies, a logline that would become forever associated with the publisher. Outside of historical context, the story does stand up pretty well, though the nice buildup results in a rather rushed ending. Wally Wood’s art just barely keeps “Terror Ride” from becoming “terrible,” as its old hash spooky-amusement park/waxworks hijinks we’ve seen plenty of times before. I’m inclined to think that Gaines and Feldstein were reading through Bennet Cerf’s Try and Stop Me again, as “Death Suited Him” is based on a popular urban legend—the reprint this issue, “House of Horror,” was culled from Cerf’s tome—that the E. C. ghouls reconfigured to fit their needs, changing the legend’s “white satin dress” to a tuxedo and switching up the gender of the main character to fuel the villain-gets-his trajectory of the plot. Jack: "Terror Ride!" was my favorite story, and not just for the wonderful art by Woody. I thought the journey on the boat was very entertaining, as the happy couple pass one horrifying scene after another. I liked the ending, too, and thought the plot worked out in a satisfying manner. The living corpse in "A Shocking Way to Die!" decomposes very quickly, unlike the tuxedo in "Death Suited Him," which is in perfect condition after four months underground. I guess an airtight coffin keeps things fresher longer. John: I'm a sucker for a good reanimated corpse tale. 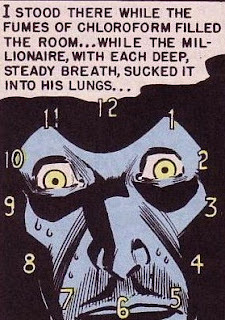 Or, as in the case of "A Shocking Way to Die!," a half-way decent reanimated corpse tale. I just couldn't understand why James Cooper proclaimed his innocence so vehemently before promising to come back and get those who sent him to his death. I might have enjoyed "Terror Ride!" 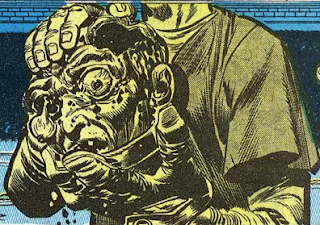 for Wally Wood's art if we were shown any of the terrifying things on display in the dark boat ride. The return of “House of Horror” gives us time to consider why, if you're going to include a reprint, would you pick such a dog. Surely they could have found a better 6-page story to use. 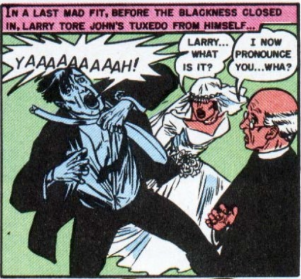 I thought “Death Suited Him” was a pretty silly premise to justify grave-robbing, but the twist elevated it above most of the other tales in this generally lackluster issue. 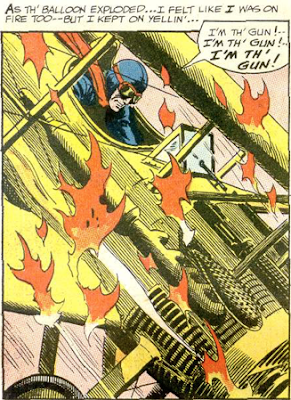 Pete Luger has just had a rude awakening. Once a big-shot of the criminal underworld, he now wiles away his afternoons lugging piles of brick in a prison work yard to the jeers of his fellow hoods. All he needs is a getaway, the smallest chink in the prison’s security system to facilitate his escape to the other side. It seems like the only cons who ever make it past the exit are the ones who get carried out in pine boxes. Just like that, Luger has his plan. Securing a position as the jail’s morgue attendant, Luger passes the word to his buddies on the outside that he’ll stow himself away in a coffin to be intercepted by his comrades when the hearse makes it ways to potter’s field. The plan seems to go off without a hitch, but when two cons arrive to pick up the casket they finish Luger’s half-assed job by nailing the lid down and taking it downstairs where Pete Luger gets his second rude awakening: the piles of bricks that they’ve just spent the last few months unloading have been used to construct the prison’s very own crematorium. As clipped and sparse as a James M. Cain potboiler, “Escape!” earns high marks for its assured delivery and the smooth transition of its visuals under Feldstein’s practiced pen. In an issue brimming with ghoulies and ghosties, it says something that the most powerful of the lot is a tense little thriller about a criminal with one too many bright ideas getting one of the publisher’s most blackly ironic punishments to date. It’s a whip-smart climax that could certainly please O. Henry and Roald Dahl. The reader may be forgiven for groaning early on in “Werewolf Concerto” as the tale’s stale-by-1951 “twist” rattles to its inevitable conclusion that finds Herbert Antone, the proprietor of a Belgian resort hotel, suffering from recent mysterious attacks by a wild animal, not only revealing to the reader the terrible curse of lycanthropy that plagues him but discovering that the famed pianist to whom he’s provided free room and board to boost up tourism and who only goes out at night is a vampire with bloody eyes set on his canine jugular. Even with some effective touches sprinkled throughout, the tale is clearly a freshman effort for later stories where Craig will have his monsters mash and upend conventions of the genre. 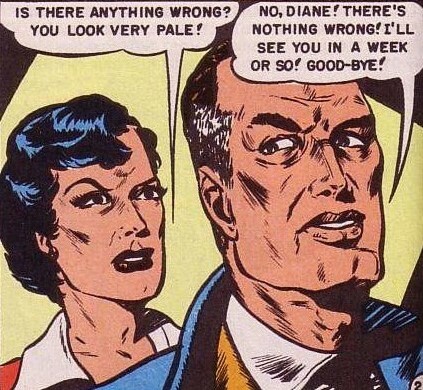 Kamen gets stuck with an even staler premise in “The Grave Wager,” another in a line of “bored dilettantes playing ghoulish pranks/initiations” following “Report from the Grave” (VOH #15) and “A Fatal Caper” (TFTC #20), this time focusing on two chums who challenge their cocky friend to stay up all night with a corpse for a cool hundred bucks, only for the circus performer posing as the “corpse” to get up and give the jerk a fright and thus effectively bring about the performer’s death by candle-beating and the jerk’s descent into white-haired madness. Peter: The obvious winner here is “Escape,” thanks to its clever twist ending. Most of the stories we’re reading in these horror comics contain either telegraphed twist finales or (pretty much) no finale at all. Witness “Werewolf Concerto,” with its obligatory “you’re a werewolf but I’m a vampire” closing panel, and “The Grave Wager,” wherein one of Roger’s pals states the bleedin’ obvious just in case we didn’t get it. On the Ghastly watch, “Fitting Punishment” shows that Graham is heading quickly for that legendary status after a slow beginning. That final panel, of Stanley’s corpse astride his crutches sans feet, is a real shocker and is a perfect example of why we sick puppies hold EC so close to our (-choke-) hearts! One thing I can state positively: 1951 will be a much better year for EC Horror than 1950. Jack: I was surprised in "Werewolf Concerto!" when Hubert turned out to be the werewolf, but the other revelations were as expected. I do love Craig's art and method of storytelling, though. I agree with Peter about Ghastly's art in "Fitting Punishment!" --it was the best story in the issue and the art fit perfectly. Kamen's streak of mediocrity continues with "The Grave Wager," which is the weakest story, as usual. "Escape!" is fun because you know something will go horribly wrong but you don't know what or how till the last panel. The main character inspired a famous steakhouse in Brooklyn. John: "Werewolf Concerto!" was definitely a groaner (the panel on the last page where Hubert hits the piano keys to the tune of CLUNK! CLUNK! CLUNK! sums it up quite nicely), but I couldn't help but smile at the absurdity of the Vampire Pianist living in her grand piano. While Jessica Mitford's seminal tome on the funeral industry, The American Way of Death, wouldn't be published until 1963, it describes abuses just like those Feldstein includes in “A Fitting Punishment.” Ingels's art is the icing on the cake to my favorite story in this issue. If only all unscrupulous funeral directors got the same just desserts as old Ezra... "The Grave Wager" reminds us that the '50s were a simpler time, when a couple of buddies would get together for a good time and go dig up a corpse in order to prank their friends. It's a shame no one has been able to make an entertaining story out of that premise. Fortunately, things end on a high note with “Escape!” As my colleagues have pointed out, it's a refreshing change of pace when the plot twist you know is coming finally arrives and it hasn't been fully telegraphed in advance. And best of all, it's clever! No, "Surprise—I'm a Vampire!" here, thank goodness. On Sale Monday, May 23rd!